A cornerstone of successful performance management is support from leadership and good use of analytics. Federal agencies don’t field baseball teams, obviously. But they too collect valuable data that tell important stories about how they’re doing in carrying out their missions. Virtually every agency collects data but many struggle to turn the information into useful information that can inform and drive decisions. Yet, trends in that data can pinpoint problems, underscore successes and steer officials toward alternatives, and perhaps better ways of carrying out their programs. Agencies that have extracted the important lessons from their data and relied on the information to manage performance have reduced marine accidents, bettered the quality of the care patients received in nursing homes and improved how Social Security services are delivered. The data became useful information that staff relied on to analyze programs and improve results and, yes, sometimes hit the ball out of the park. Whether agencies have fully immersed themselves in analyzing data, or have just begun the process, some basics have become apparent. If agencies want to improve program effectiveness and efficiency, they need to manage performance, and to do so, they have to measure it. The measures they choose need to be meaningful and linked to a desired goal or result. If ending veterans’ homelessness is the goal, for example, a better indicator for success than how many housing vouchers are issued is likely to be how many veterans get into housing. The clarion call to fix government has put great pressure on federal agencies to manage better and to be accountable and transparent in the process. In the midst of the tremendous fiscal uncertainty the nation now faces, and with public attitudes toward government at an all-time low, it is more critical than ever that federal leaders base their decisions on accurate data and not on anecdotes, incomplete information or the belief that things will work out for the best—particularly when those decisions have huge consequences on tax dollars and society. Read the Federal News Radio story on this report. Read the Federal Computer Week story on this report. 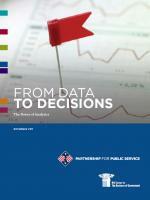 Read Government Executive's story on this report.